Volodymyr Zelensky, who plays a history school-teacher accidentally propelled to the presidency, won around 30% of the votes, according to exit polls. With around two-thirds of the ballots counted, the actual results are indicating a similar outcome. In second place is Mr Poroshenko with 16%; Ms Tymoshenko is currently third with 13%. Mr Zelensky will now face either Mr Poroshenko or Ms Tymoshenko in the second round scheduled for April 21st. He looks likely to win then. ON APRIL 1ST, appropriately enough, a comedian who plays the president in a popular TV show, “Servant of the People”, emerged as the likeliest next leader of Ukraine, coming well ahead of the incumbent, Petro Poroshenko, and a former prime minister, Yulia Tymoshenko, in the first round of the presidential election. Volodymyr Zelensky, who plays a history school-teacher accidentally propelled to the presidency, won around 30% of the votes, according to exit polls. With around two-thirds of the ballots counted, the actual results are indicating a similar outcome. In second place is Mr Poroshenko with 16%; Ms Tymoshenko is currently third with 13%. Mr Zelensky will now face either Mr Poroshenko or Ms Tymoshenko in the second round scheduled for April 21st. He looks likely to win then. The result is a resounding slap in the face to an entire Ukrainian political class. Mr Zelensky, a man with no political experience but with huge popularity as an entertainer, stepped onto the political centre-stage to expose the failures of Ukrainian rulers who may have experimented with various costumes and roles, but invariably represented dubious oligarchic interests for much of Ukraine’s post-Soviet history. Mr Poroshenko, a confectionery magnate, was elected five years ago in the hope that he would stop the war started by Russia and use his business experience to improve the country’s dire economic situation. But he turned himself into a war-time president, wrapping himself in the Ukrainian flag. He campaigned under the slogan of “Army. Language. Faith”. He chose Vladimir Putin, Russia’s president, as his real election opponent and appealed to more nationalist-minded western Ukraine, ignoring the Russian-speaking east and south of the country. As a result, he became a highly divisive figure. Mr Zelensky, on the other hand, not wishing to divide opinions and votes, said almost nothing about his politics. He took votes across the country, not least among Russian-speakers. He exploited one factor that unifies the country regardless of language and faith: total disillusionment with traditional politicians. He did not hold political rallies or participate in television debates. Instead he toured the country with concerts and stand-up comedy acts, giving two shows a day—one free, and one paid. Unlike his rivals, some of whom had to pay people to come to their to rallies, Mr Zelensky actually made money from ticket sales. 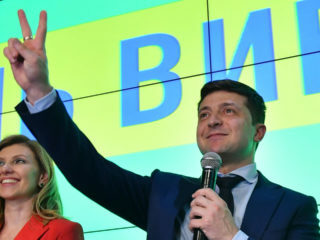 Even on election night, on March 31st, Mr Zelensky continued to entertain. Minutes before the polling stations closed he played table tennis in his press centre, which had something of the atmosphere of a variety show, with quiz shows and stand-up acts filling the gaps between Mr Zelensky’s appearances. But for all his showmanship, the winning team consists of cool-headed lawyers and business partners who run a tight ship. The 41-year-old Mr Zelensky and his team are very different from the political class that has milked Soviet-era industrial assets and resources over the past decades. And while Mr Zelensky does not have a core electorate, he appeals to the urban lower middle-class—traders, taxi-drivers and craftsmen who have rarely voted and stayed at home watching television during the Maidan revolution of 2014. For all the talk of transparency, Mr Zelensky remains a mystery. His show runs on a TV channel owned by Ihor Kolomoisky, one of the country’s most controversial oligarchs, who lives in Israel. A scandal involving his PrivatBank, which was bailed out and nationalised, cost the country nearly $6bn. Some of his assets have been frozen by British courts. This prompts speculation that Mr Zelensky, too, is the puppet of an oligarch, though so far it is Mr Kolomoisky who owes money to Mr Zelensky rather than the other way around. It is entirely possible that Mr Zelensky’s turn to politics is almost as accidental as that of his character. If there is one man to whom Mr Zelensky owes his sudden political good fortune, it is Mr Poroshenko himself. According to one of Mr Zelensky’s business partners, the idea of turning his TV show into reality was planted in his mind by Mr Poroshenko’s analysts who, two years ago, measured the actor’s ratings only to discover that he was the most popular choice. He was seen, at the time, as the perfect spoiler against Slava Vakarchuk, a popular rock singer who tantalised Ukrainians with the idea of a run for the presidency, only to back down. Mr Zelensky then emerged as a prime candidate. Mr Poroshenko now has to face the man he has helped to create.